September 23, 2011 by andrea | Filed under Autumn, Chicken, Comfort Food, Main Dish, Quick Cooking, Recipes. In honor of the first day of Autumn, here’s a good comfort food recipe for Braised Chicken with Mushrooms. This simple yet flavorful dish will definitely be making it onto my dinner table throughout the comfort food months! The medly of mushrooms and a little Madeira (or dry sherry) make a delicious, earthy sauce for the chicken. Mmmm, comfort food! For the chicken, I used four skin-on, bone-in half breasts since the recipe didn’t specify boneless breasts. I was unable to find Madeira, a fortified Portuegese wine, so I substituted dry sherry. I didn’t think 1/4 cup would be enough but once the mushrooms release all their moisture, you have plenty of liquid for braising the chicken. I finished the dish with chopped parsley instead of tarragon (chopped fresh thyme or rosemary would also be a good substitution). I served the dish with baked potatoes (next time I’ll make mashed) and steamed veggies. Crusty bread is a must, too. Enjoy! To complete the menu, serve with egg noodles or mashed potatoes and a green salad. This dish can be prepared up to 1 day ahead to allow time for the flavors to blend. Reheat, covered, on the stovetop over medium-low heat until warmed throughout. 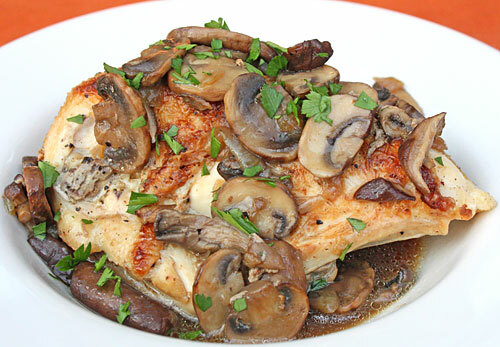 Divide the chicken among dinner plates, spoon the mushrooms over the chicken and serve immediately. Serves 4. This recipe sound like a good one to start into a little cooler weather. It has been so hot in Texas, we are ready for the Fall. Having this one tonight, thx!